Want to be a better saver? You’re in the right place. Here are four reasons you stink at saving and what to do about it. You don’t know what you’re saving for or why. Saving is a great first step, but if you don’t know what you’re saving for — why would you do it? We talked about this a few posts ago — if I could only teach my kid just one financial lesson. The gist was to identify goals and desires that are meaningful to you. Not meaningful to society or your mom or your old college roommate, but you. Once you know what you want, make trade-offs to work towards those goals. Part of making trade-offs is being conscious of your spending. If you’re a mindless spender (like many of us can be), you’ll have a hard time. So cut it out, pay attention to what you’re spending and make sure it’s in line with your goals. Identifying goals and desires sounds good in theory, but do you actually think those goals and desires are attainable? Do you have faith and confidence in yourself? Let’s say your dream is a 2-week trip to Europe. If you think there is no way you’d ever be able to afford such a trip, you’ll be stuck. If you work on your thoughts, believe it’s possible AND direct your actions and make specific choices, you could very well be on your way. I think the best way reach goals is with baby steps and consistency. In this case, instead of trying to save a ton of money every month (an amount that would be difficult on your wallet) OR paying for the trip on credit, break it down. How much do you need in total? About $5,000? When do you want to go? In 3 years? $5,000/3 = $1667/year or $139/month. Now, in my mind $5,000 seems like a lot, but $139 doesn’t seem like that much. If it does, are there ways you could trim it even more? Do you need that much money? Could you push the trip out a few more months or another year? Are there ways you can boost your savings? Maybe by starting a side gig or selling used items on Craigslist? Get creative! While you’re saving, remind yourself how far you’ve come. I love these visual savings goals on Etsy. You’re thinking short-term instead of long-term. In any given day or month, you have a finite amount of income. You get to choose where it goes. If you choose to spend it, the money will be gone. If you choose not to spend it and invest it instead, the money will grow, making new money. And this, my friend, is the absolute best. J.D. Roth wrote a great in-depth article titled Opportunity Costs and Conscious Spending. Check it out. It’s a long game. It takes time for money to make money in meaningful amounts. Read more about the rule of 72. 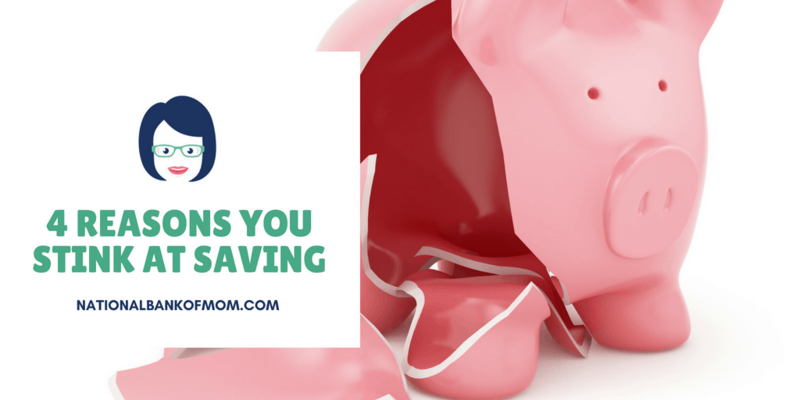 Saving isn’t all or nothing. It’s not “I’ll either save all of the money ever” OR “I won’t save any of it.” Life isn’t black and white, but shades of gray. Think about how much you can comfortably spend and save. Do those amounts let you live the life you want to live now (and will they later)? Do you need to tweak the balance? You associate spending money with happiness and saving money with… well, not with happiness. If spending makes you happy, you’ll spend. If saving makes you happy, you’ll save. So, how do you get to a place where saving makes you happy? What are your thoughts? Comment with other reasons (and potential solutions) below!